Do you ever feel stuck? Like no matter what you do, no matter how hard you try, nothing changes and your prayers go seemingly unanswered? You may wonder why other people appear to "have it all", while your prayers seem to go unanswered. You may know and understand that God has a plan for you, but when nothing seems to be going your way, it can leave you feeling abandoned, forgotten, and overlooked. During difficult seasons of life, staying positive may be much easier said than done. So what do you do when you feel tossed aside and undervalued? When your heart feels heavy and your faith has been trampled? While you might have a great plan for your life - God has a better one. (CLICK TO TWEET) Though you may feel this season of your life is not only unnecessary, but even unbearable; God has a plan. Your life might not be where you would like it to be right now, or even where you feel it should be, but God has things in store for you that will completely surpass anything you imagined for yourself. However, you won't get there all at once. Receiving all that God wants for us is a process. There are different kinds of seasons. There are seasons of planting, seasons of watering, fertilizing, pulling up the weeds... all are important seasons. Not every season is a growing season. Not every season is a harvest season. Below are a few examples of potential "seasons". Throughout life we will each experience these "seasons" - even multiple times. No matter what season you are currently in, remember, each is equally important in becoming who we want to become. Often in life we are in the season of preparing; the season where we prep our "soil" to be a solid foundation for us to grow. Nothing will grow well without healthy soil. Gardeners spend lots of time (and even expenses) to be sure their soil is strong and durable. Truly great soil can take years to create - but taking the time to do so will result in a much more beautiful and strong garden. How can you improve your "soil" or "foundation"? Maybe it's through education; learning skills that allow you to achieve your dreams. Maybe you need to declutter your life, eliminating things that do not help you grow. Or maybe you should be taking better care of yourself - physically, emotionally, mentally, or spiritually. If a gardener wants tomatoes, they plant tomato seeds. They wouldn't plant zucchini seeds hoping it would turn into a tomato. Similarly, if you want a certain outcome in your life, you should "plant seeds" that will help you achieve that outcome. People often say that you can choose your choices, but you can't choose your consequences. I disagree. If you want a certain outcome (or "consequence"), then make choices that will help you achieve that. Decide what you want and then plant "seeds" that will get you there. If you are in a "planting season", remember, you sow what you reap. Be sure that you are making choices that will lead you closer to what you want to accomplish and who you want to become. A garden will not thrive without the proper conditions. As I mentioned before, the soil, or foundation, is vital to healthy growth - but that is not all. Once you have a solid foundation, you still have to care for the growing plant. This means paying attention to the climate/temperature, and providing the correct amount of sunlight and water. Eliminating weeds is also vital to helping a plant grow. Weeds compete with plants for water, sunlight, and other necessary nutrients, which can negatively affect the growth of the plants. Growing seasons are often hard seasons. These are times of testing where we show God what we are made of. It requires hard work, diligence, and dedication. Just like the garden, your environment plays a huge role in your growth. Are you paying proper attention to your environment and how it affects you? Are you putting yourself into situations that promote growth or shut you down? Are you allowing "weeds" to grow? What can you do today to help promote better growth in your life? Maybe you are in the middle of the waiting season - you've planted, watered, fertilized, and maybe even pulled some weeds - but nothing seems to be changing or improving. This season requires just as much work as the previous seasons, but it is a different type of work. This requires the work of faith. You are in a waiting period, a period where you might not see much growth because it is a development season. You have to trust that as you patiently wait, in time, things will grow. However, during the "waiting", don't neglect. If a garden is neglected, it will likely die. Without the proper care and attention weeds may take over. Fertilizing, watering, and caring for a garden will help it thrive. As you wait for your prayers to be answered, don't neglect your own growth. Continue praying. Continue "nourishing", "fertilizing", and "weeding". Keep a good attitude and a positive outlook even when you may not be seeing any growth. When you feel like nothing is changing or that your prayers aren't being answered, keep in mind that "No" doesn't always mean never. It's just not the right time. This is all a part of the process. God might have an incredible gift for you, but He won't give it at the wrong time. Be patient in every season. Want to learn how to enjoy every "season" of life? Start by changing the way you view the "season". When you change the way you look at things, the things you look at change. To help you better enjoy each season of life, we created the "LEARNING TO ENJOY THE RIDE" free printable. To get yours click the button below. 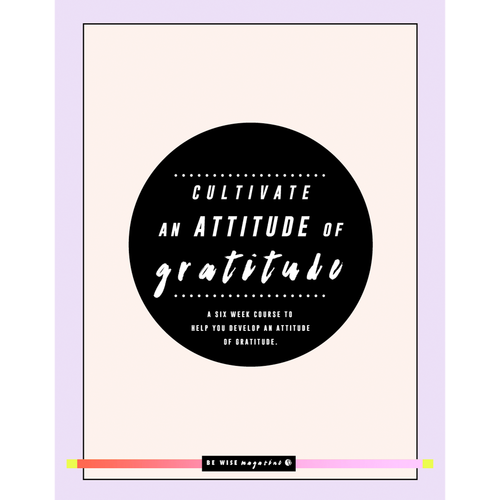 If you still want more, check out our CULTIVATE AN ATTITUDE OF GRATITUDE COURSE and our OWN YOUR OWN HAPPINESS COURSE. Inside these courses you will learn how to be more grateful - in every circumstance. You will be able to create your own happiness regardless of your situation. You will learn to recognize the blessings you already have and be able to better enjoy your life - exactly as it is.